School zone speed limits exist for a reason. Drivers often neglect to obey school zone rules, putting children and safety personnel at risk. Our Oakland personal injury law firm believes that civil injury suits serve to compensate victims and that they also serve as a preventative measure, providing an additional incentive for safe and responsible driving behavior. According to The Oakland Tribune, school had only been in session for five minutes when an accident injured two adult and one child in front of Turner Elementary School in Antioch. Police report that the driver of a rented Audi SUV was speeding at around sixty miles per hour and generally driving carelessly in the eastbound lane of Delta Fair Boulevard at about 8:05 A.M. The SUV swerved around another vehicle that was stopped at a red traffic signal and hit three pedestrians before hitting another car that was turning onto School Street. The victims included a crossing guard, her eleven year old son, and another woman. Both adults suffered severe injuries and a medical helicopter transported them to John Muir Medical Center. The child suffered minor injuries. Witnesses report the crossing guard and the other woman were talking on the corner of a crosswalk and the boy, who was out of school for fall break and celebrating his birthday that day, was seated in a chair nearby. After the crash, both the SUV driver and a passenger escaped from the vehicle that was left sitting on its passenger side in a nearby driveway. Bystanders report both occupants of the SUV were males in their early twenties. Both men fled, but one returned after running about a block and said that he was the driver. The man appeared intoxicated and he told officers that his companion had an outstanding arrest warrant. Police Captain Steve McConnell said he found the confession to be suspicious and that the man may have taken the blame for his companion. 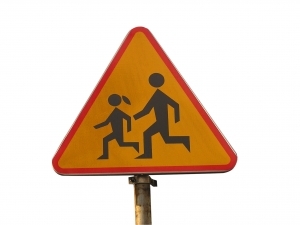 According to California law, unless posted signs state otherwise, drivers must slow to 25mph when travelling within 500 to 1,000 feet of a school when children are either outside or crossing the street. In some school zones, speed limits are as low as 15mph. These reduced speeds exist because children may be unable to accurately judge speeds and distances to determine when to safely cross and because children may also dart suddenly into the road. Specific traffic laws also govern driving near a school bus, requiring drivers in either direction (unless travelling on the other side or a divided highway) to stop when a bus flashes red lights and remain stopped until the lights are turned off. According to a report by SafeKids USA, distracted drivers are a concern nationwide, but they pose a particular danger in school zones. The study found one in six drivers travelling through a school zone were distracted. Cell phones are a common issue, but things like eating, reaching for objects, or even personal grooming also cause distraction. The study did not specifically examine the tie between distraction and accidents in school zones, but the safety risk seems evident. The report also cited a Canadian study that concluded the area within 150 meters of schools had a higher risk of accidents and fatalities involving children than areas more than 300 meters from a school facility. Unsafe driving is never okay, but it is particularly disconcerting when it occurs in areas frequented by children. If you or your child suffered an injury due to a school zone accident in Oakland or elsewhere in the Northern California region, please contact our firm. Attorney Greg Brod and his support team are committed to helping victims and to reminding drivers that risky behaviors on the road will not be tolerated.